If you've been reading this blog, then you know what to expect in this entry. Another summary of my weekly trip to Costco! Costco's coupon book had a buy-one-get-one-free offer for a spindle of 100 Sony CD-r's. These were $18.49 for one spindle, but the other was free so in effect they were $9.245 each. What bugs me is the leeches at the State Board of Equalization insist on collecting sales tax on the total amount before any coupon reduction so I had to pay tax on $18.49 x 2. Normally I am very picky about my CD's, sticking to the Taiyo Yuden (TY) brand which is supposed to be the best. Those are made in Japan (yes I know, I am a snob - anyone who knows me will tell you I turn into a raving fanatical lunatic when talking about computers or stereo/audio gear). 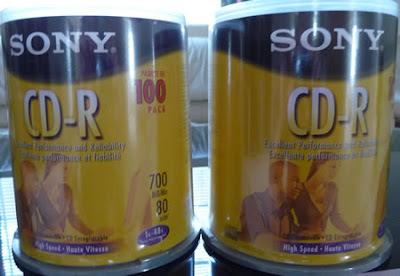 These Sony CD's are made in Malaysia. TY's run about $24 for 100. I use CD's for much more casual uses these days so quality isn't as important. I'm not all that keen on the Sony brand myself except for anything having to do with a picture screen (like televisions or monitors) but for $18.49 (plus tax on $36.98), I decided to take a chance. 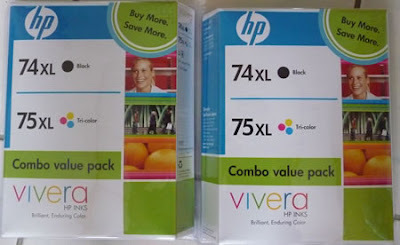 Another coupon deal was buy any two HP ink/toner packs and get $20 off. Sounds great, doesn't it? Except the price of these ink cartridges always gives me a heart attack. A few weeks ago I bought one of those HP multi-function machines (copy, print, scan, fax) for Julie at a bargain price. But they have to make up the profits somewhere, and they overcompensate on the supplies. $57.99 for each two pack of black and color cartridges! In effect, the coupon is worth $10 per package, so that's still expensive, especially having to buy two. But then Costco's price is still a lot lower than the office warehouse places and I figured I would have to eventually buy them anyway, so why not today. Next, in the interest of conserving space I put two products in the same picture. Since they are both for cleaning, that makes sense, right? 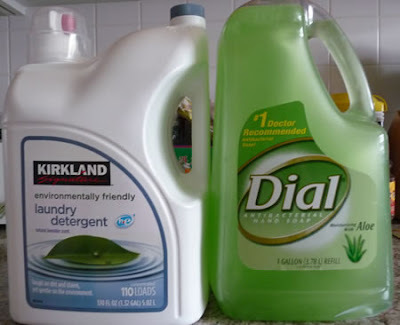 Costco environmental friendly laundry detergent, and Dial liquid hand soap refill. I'm the type who sees no difference in detergents so I stick with Costco stuff mainly because I trust them. This is the first time trying the environmentally friendly one, though, so I hope it works well. Previously I bought the envrionmentally hostile version which seems to work fine but I'm trying to be more conscious of our environment. I even stopped buying bottled water! As for the Dial soap, I'm a sucker because it was on sale with a $2 instant rebate (of course the tax was on the pre-rebate price). I keep doing these things and now we have about five or six bottles of refill soap stashed in the cabinet. Makes me feel like a Nisei. Finally, a bag of pine nuts. These are so yummy sprinkled on things, and they are shelled. 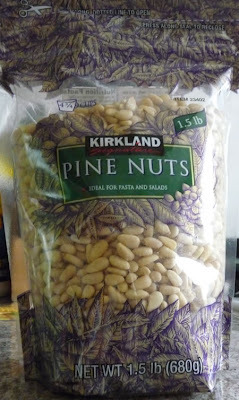 When I was little, my dad used to buy pine nuts and I loved them. The only thing was they came shell-on and it was such a hassle working so hard to get a tiny little nut for all that labor. Now Costco makes it easy, and their price is a lot lower than anywhere else. I apologize if you think I am crazy always writing about Costco, but I just can't help it. I love that store! Before we visited my mom today, we stopped at Mitsuwa Market for lunch. I forgot to bring my camera inside. We got something from the little food court, and afterwards took a look around in the market. That's when I saw all the bento and sushi plates and wished I had looked in the market before ordering from the food court! Oh well, next time. Then we visited my mom. She seemed in good spirits but is still very forgetful. The care facility that has now been her home since Thursday is sooo much nicer than where she was the prior three weeks. It's clean, pleasant, peaceful, cheerful, and the staff seems really attentive and caring. I'll be taking my dad there on Monday and they're looking forward to seeing each other. I told my mom yeah, now she and dad can sit there and argue all day, haha.